An expansive selection of genetically engineered mouse models are available through Taconic Biosciences' cryopreserved model repositories. The Genetically Engineered Models (GEM) Collection grants non-profit organizations access to several hundred proprietary GEM lines, primarily on a C57BL/6 genetic background. The collection contains mainly conditional and constitutive knockout (KO) mice, transgenic over-expressing lines, and conditional and constitutive targeted transgenic lines. Accessing GEM Collection models requires an MTA between the originator and host institutions. Deliverables include at least two (2) heterozygous mice. In rare cases that the cryopreserved material also contains a recombinase gene, the deliverable may be reduced to one (1) heterozygous mouse. Taconic's Knockout Repository (KOR) grants academic and commercial researchers access to over 4,000 fully licensed, knockout mouse models. The KOR models were generated by Lexicon Genetics Incorporated, using proprietary embryonic stem cells and two proven technologies: Gene Targeting and Gene Trapping. Commercial, academic, and NIH terms of sale are listed online, and Phenotypic Data Packages are also available for KOR lines. KOR Deliverables include a minimum of four (4) mice, heterozygous for the selected mutation, including at least one (1) breeding pair on a mixed 129S5;B6 background. The full conditions of use are located on any EZcohort® model page by clicking on the 'Licensing' accordion. The deliverables for EZcohort® models include a cohort of four (4) mutants (at least heterozygous for all alleles) within 12-16 weeks of a placed order. What are the options for cryopreserving a model with Taconic? There are a number of opportunities for investigators that wish to cryopreserve models with Taconic. Our world-class genetically engineered model management group can walk researchers through the various options to preserve their own lines for use in different rapid embryology techniques or for storage. If researchers want to learn about participating in the EZcohort® program with their model, please contact us through our website. What kind of guarantees are associated with Taconic's cryopreserved models? As with many living systems, the qualitative and quantitative guarantees differ with the complexity of the models. With Taconic's repository and EZcohort® models, the deliverable guarantee is live animals that are amenable to propagation and utilization. The expectation in terms of phenotype or performance in specific research processes is not part of the guarantee, but the assurance that the recovered model is viable for use in studies is part of the guarantee. Are rat models also available in Taconic's repositories? At present, there are a few cryopreserved rat models available through Taconic. However, models in the KOR and GEM collection are, at this time, specifically mouse. As we expand our repositories, we expect an increase in the number of rat models that are made available. 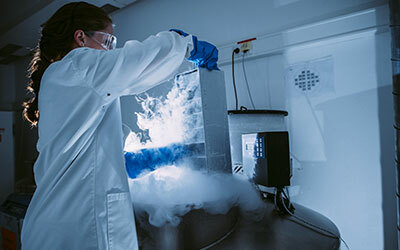 What are the options for expanding cohorts beyond the base deliverables associated with Taconic's cryopreserved model repositories? Taconic's Frapid® expansion process intersects rapid embryology with the access of models through standard cryo-recovery. The process can yield anywhere between forty and one-hundred line animals, depending on the quantity and quality of cryopreserved material. All repositories differ in these material aspects, but, in every case, Taconic will work with clients to determine the fastest way to arrive at their desired cohort. Is validation data or phenotypic information available for any models in Taconic's repositories? The data available is often dependent on the depositor. In the case of the models in our KOR, phenotypic analysis has been fairly extensive. KOR models have undergone a battery a phenotypic characterization, including metabolic and cardiovascular assays, assays of immune system function, neurological assays, and phenotypic characterization related to cancer. This data is made available through Phenotypic Data Packages, which are provided through the sponsor at an additional fee.